On 21st October 2009 I went to see the opera “The Rake’s Progress” by Igor Stravinsky at the “Théâtre de la Monnaie” in Brussels. Here is a report of what captivated me the most. 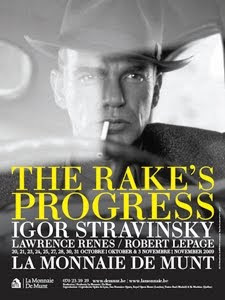 “The Rake’s Progress” is the first opera written in English in the early 50s by Igor Stravinsky. It is the story of lazy Tom Rakewell who is in love with Anne Trulove. Shortly after they split up, a certain Nick Shadow informs him that an uncle having just died has left him a fortune. This devilish person is actually offering him an easy life full of lust but Tom will have to pay the price a year later. Seduced by this perspective, the hero follows Nick. Why work when it is easier to go to saloons and film sets? Abandoned and without news from her lover, Anne still hopes they will get back together and decides to go and look for him in town. Much to her despair though, Tom is married to Baba the Turk, a woman with a moustache. In the meantime, Tom has lost everything and is now unhappy. He even kills his wife before finishing his days in a lunatic asylum. The opera ends with some piece of advice about life and people. This story was inspired by an 18th-century cycle of eight English paintings illustrating the dissolute life of Tom Rakewell, the son of a rich merchant, who gambles away his fortune. The stage director, Robert Lepage, decided to set the action 1950s Hollywood, when the industry of the seventh art produced a lot of westerns. A contrast is worth being mentioned in this opera. The difference between the futility of life and pre-war cinema as well as the sweetness and faithfulness of Anne Trulove, who carries her name very well are prominent features. This shows the opposition between debauchery and greed with faithfulness and love. Anne only wants to love while the others want power, money and an easy life. Another point worthy of interest is the scenery. It was picturesque. The first scene presents a couple with a sort of a cinema screen behind them, which projects a beautiful summer blue sky and moving clouds. Later the blue sky becomes a dark night sprinkled with twinkling stars. Later again, it depicts a mighty sunset above the sea. At any given moment the sky is “moving”, it is not fixed and is truly breath-taking. The opera was very colorful and pleasant to look at. Each scene had its own striking elements: a moving car, a puppet house showing the house that Anne is escaping from, a terrace with Greek columns, a lively saloon or an old abandoned saloon standing for Hell. Another impressive element is the chorus. It is a heterogeneous group, made up of about thirty people. It appears at every stage of the sequence of events: as joyful people having fun, singing and dancing in a saloon, as paparazzi and fans acclaiming Baba the Turk and Tom, then as wealthy people gossiping at an auction and also as mad people in a lunatic asylum. Now let us consider the music. It was wonderful. Sometimes you want to tell the singers to stop singing because you only want to enjoy the music. The melody was enjoyable to hear and the texts are sometimes humorous and full of wisdom. The only reproach I can find for this opera is that it was in English. As far as I’m concerned, English isn’t the most suitable language for an opera; Italian or German should be preferred for this kind of art. All in all, “The Rake’s progress” was a fantastic opera that I enjoyed a lot and recommend to everyone.